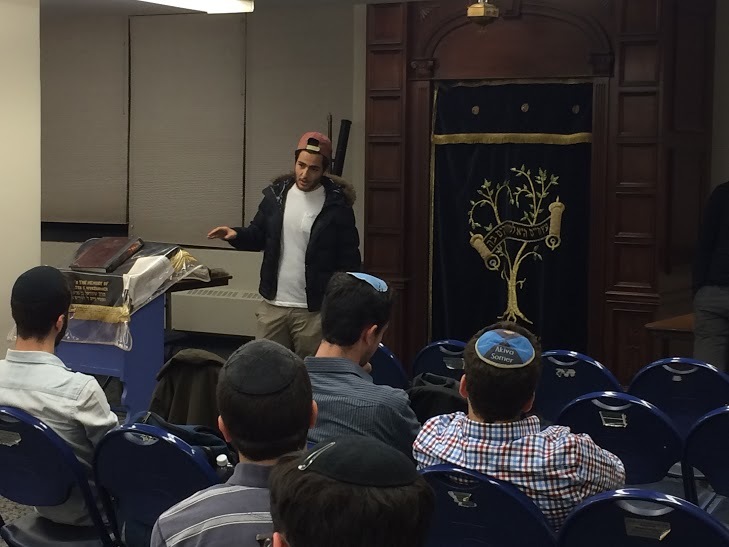 Last week, Yeshiva University students received unique insight into the recent Paris attacks—and day-to-day life for the Jews of Europe—as their own fellow students shared their experiences as European natives. French student Ruben Journo shares his experiences with students at a solidarity gathering after the attacks in Paris. At an event in the Rubin Shul, French students Arie Barkats and Ruben Journo and student Alex Wascher from Vienna spoke about the current situation in France, the impact the attacks had had on those they know and the future for Jews in France. For Journo, whose high school teacher had been stabbed by three terrorists outside his school in Marseilles the previous week, it was especially important that so many students came to hear and support the group. “It shows that there is a lot of solidarity and that all these people care about what happened in my country,” he said. Last week, students also took pictures with the French flag on both campuses to show their support for the country. Ilan Swartz-Brownstein, a senior majoring in marketing at Sy Syms School of Business, contributed to this post.